HICKORY, NC - The Texas Rangers, MLB parent club of the Hickory Crawdads, have announced the addition of five more former 'Dads to their Major League 40-Man Roster -- RHP Jake Brigham ('09-'10), RHP Roman Mendez ('11), LHP Martin Perez ('09), RHP Neil Ramirez ('09-'10) and 3B/RHP Matt West ('09-'10). Brigham, 23, spent the entire 2009 campaign and the second half of the 2010 season in Hickory. As a Crawdad, Brigham compiled an 8-16 record with a 4.49 ERA through 39 outings and 30 starts. The Orlando, FL native spent the 2011 season with the Frisco RoughRiders (AA), going 6-6 with a 4.49 ERA. He was originally drafted by the Rangers in the 6th round of the 2006 draft out of high school. Mendez, 21, put together an All-Star season with the 'Dads in 2011, posting a 9-1 record with a 3.31 ERA in 117 total innings of work. Mendez, an SAL Mid-Season All-Star, struck out 130 batters while walking only 45 through 26 outings (20 starts). A native of San Pedro de Macoris, Dominican Republic, Mendez was acquired by the Rangers in a 2010 trade that sent MLB catcher Jarrod Saltalamacchia to the Boston Red Sox. Perez, 20, spent the majority of the 2009 season with the Crawdads before being promoted all the way to Frisco at the age of 18. With the 'Dads, Perez went 5-5 with a 2.31 ERA in 22 outings and 14 starts. Most notably, he started the Crawdads 3rd all-time no-hitter against the Bowling Green Hot Rods on April 11, 2009. In 2011, the Guanare Estado Portuquesa, Venezuela native split time between the RoughRiders and the Round Rock Express (AAA). He was originally signed by the Rangers in 2007. Ramirez, 22, spent the majority of the 2009 season and the entirety of the 2010 campaign with the Crawdads. Ramirez struck out a career-high 142 batters in 2010, complementing a 10-8 record and 4.43 ERA. Overall with Hickory, Ramirez went 13-14, along with a 4.54 ERA and 198 strikeouts in 46 total appearances (40 starts). He split the 2011 campaign between the AA and AAA levels, making six starts with Frisco before being promoted to Round Rock, where he made 18 starts. The Virginia Beach, VA native was selected out of high school by Texas in the supplemental 1st round of the 2007 draft. West, 23, served as the Crawdads starting third baseman during the 2009 and 2010 seasons, before making the switch to the mound as a relief pitcher in 2011. With the Crawdads, West hit .229 with 18 home runs and 103 RBIs in 250 games. The Bellaire, Texas native made his pitching debut in 2011, appearing in 23 games with the Spokane Indians (Short-A). West led all Indians with nine saves, to go along with a 1-2 record and 3.12 ERA. He tossed 26 total innings through 23 appearances with Spokane before being promoted to Myrtle Beach (High-A) and tossing one scoreless frame late in the year for the Pelicans. West was originally drafted out of high school in the 2nd round of the 2007 draft. 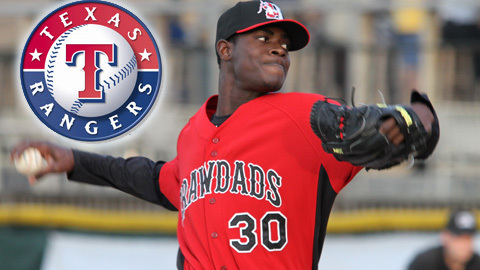 The Rangers 40-Man Roster now features 10 former Crawdads, including RHP Fabio Castillo ('09), LHP Miguel De Los Santos ('10), RHP Cody Eppley ('09), RHP Wilmer Font ('09-'10) and RHP Mark Hamburger ('09), along with Brigham, Mendez, Perez, Ramirez and West. Just in time for the holidays, the Crawdads brand-new Fireworks and FREE Food Mini Plans for the 2012 season are available right now and make great stocking stuffers! The Fireworks and FREE Food Mini Plan includes one ticket to six select Friday Fireworks games next season and your choice of one hot dog per game or a $10 gift card to the Crawdads Cafe, combining premium entertainment with great-tasting grub! Fireworks and FREE Food Mini Plans are only $42 and are available right now by calling the Front Office at (828) 322-3000! Group outings, corporate partnerships, Levine Children's Hospital Claw Club memberships and Ticket Books for the 20th Anniversary Season in 2012 are all available right now by calling the Front Office at (828) 322-3000. Keep an eye on Hickorycrawdads.com throughout the offseason for information on individual tickets for the 2012 season!